No Escape was a shocker of a movie. Sure, Owen Wilson and Lake Bell play mostly in comedy flicks and I thought they couldn't really play in something serious like an action/thriller, but trust me when I say that they nailed the part. I wasn't so sure Owen was the same Owen I know when I walked out. Wilson plays the father named Jack Dwyer and Bell plays his wife, Annie Dwyer. They have two daughters who are very very talented actresses, Lucy (Sterling Jerins) and Beeze (Claire Geare). All four do a great job. Another key figure was Hammond (Pierce Brosnan). Although he is shown in an early stage of the movie, he later becomes a great help to the family. He and his partner Kenny Rogers (Sahajak Boonthanakit) team up to battle the rebels that would have been tough for Jack and his girls to faceon their own. Their combined skills are a force to be reckoned with. No Escape is about a country undergoing a coup that starts when Jack gets a new job overseas. Little does he know the company he now works for is partly to blame. The movie hits the ground running with action and keeps on getting better and better. The whole time Jack and his family try to get away and stay ten steps of their enemies. Their hope diminishes by the hour and is even taken away just when you think they've made it. No Escape kept me on the edge of my seat the entire time. No Escape is rated R for a reason: torture, blood, intense scenes and strong violence. 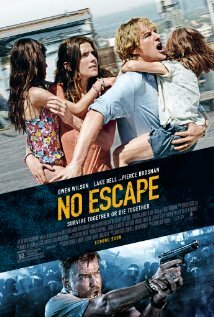 If you want to see a family go through it all and if you want to see IF they make it out alive, I would suggest you go watch No Escape. Owen Wilson shocked in this role and I really hope he plays more roles like this. I walked in with low expectations and came out amazed.